Sign up at the bottom of THIS page. Enter your email then hit SUBSCRIBE. It’s only one or tow emails a month. 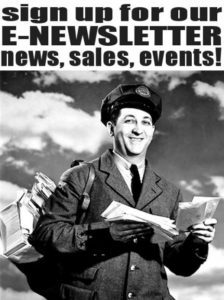 Be the FIRST to know about store NEWS, SALES & EVENTS!